5 Reasons we use the Versaclimber instead Rowers, Treadmills or Other Cardio Machines. Innovative Results was incredibly fortunate to attain two new pieces of equipment this month. As you know, we are not very fond of most machines, but these babies caught our attention and line up with our belief system. Here is a little information about the benefits of the Versaclimber and why we prefer these machines over other conventional cardio machines. The Versaclimber has been around for several years but treadmills, bicycles, elliptical machines, steppers and rowers have been more widely accepted. Here are a few reasons why we do not use the mentioned machines above and have chosen to bring Versaclimbers into our facility. 1. Treadmills. 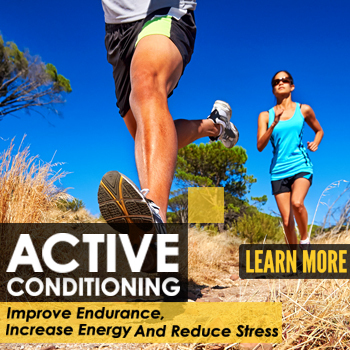 Walking and running are a fundamental movement pattern that every human being uses. Unfortunately, most people lack the mobility and strength in their feet, ankles, knees and hips to run properly. When I have asked several local doctors who their ideal client is, they have all mentioned runners. Now, I don’t believe that running is bad, I just believe that most people approach running without much of a plan and eventually get injured. The good side about treadmills, is that they are easily used by a wide population and offer an indoor option for people during foul weather. Plus: Easily scalable and allows natural gait pattern. Minus: High impact on ankles, knees and hips for most users. 2. Elliptical trainers. Every person moves differently and are obviously different sizes and shapes. I personally, have never used an elliptical machine and felt comfortable. It doesn’t feel natural at all. 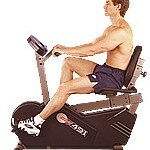 The good point about these machines, is that you are on your feet and some utilize upper and lower body movement. Plus: Reduced impact on joints, standing and some upper body recruitment. Minus: Unnatural movement patterns. Not scalable for increased intensity. 3. Stationary bicycles. Lots of people use stationary and recumbent bicycles if they have back or knee pain. Granted it offers a no impact solution, but unfortunately you have to sit. If people are sitting all day long, the last thing I want them to do at the gym is to sit some more. Now if this is the only option you have or you are a competitive cyclist, then by all means, get after it! But, if you have the option, I prefer to have people on their own two feet, learning to move their body from head to toe. Plus: Reduced impact on ankles and knees. 1. You are on your feet – The car, computer and the couch have left 80%+ of people with tight hips, upper backs and more. Why would you go to the gym and sit some more? We were designed to move on our feet. 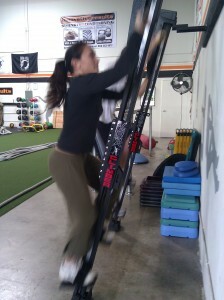 The Versaclimber teaches people to stand on their own two feet and move. 2. Your opposite arms and legs work together – grooving their neurological pathways to function properly. Our upper and lower extremities work together. Without proper communication between upper and lower extremities, movements become incredibly awkward. For example, when you throw a ball with your right hand, you should step with your left leg first, right? Try stepping with your right foot and throw with your right hand. Crazy, right? Well, as movements become more complex or if a client hasn’t developed these natural movement patterns, then learning to use opposites arms and legs together is vital to efficient movement and function. This is important for everyone. 3. No impact – most people are tight, immobile and may have old injuries that impair their gate. The Versaclimber allows a high level of muscle recruitment (upper and lower body) without any unneeded stress on the ankles, knees, hips, back or shoulders. 4. You can’t screw it up. Just get on and go. This is a very powerful point. 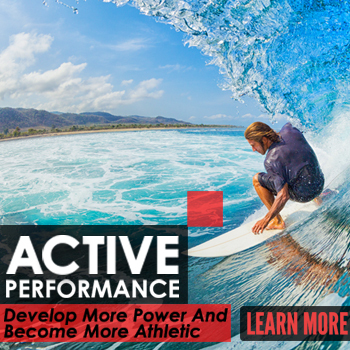 Running correctly and efficiently requires specific coaching, practice, trial and error. Rowing requires a certain level of flexibility and postural integrity. The Versaclimber requires almost zero coaching. People may start slow, but the movement is easily adopted. This is important for new exercisers, as well as elite athletes that need conditioning work, without the added impact on their systems. 5. Easily scalable. Walking is pretty easy for most of us, but sprinting will injure most new comers. The Versaclimber can easily be used for new people that want to move slowly and develop their cardiovascular system, but it can also easily be used for intense anaerobic intervals, that will challenge the most elite athletes. This versatility is incredibly valuable when your gym has a variety of clients coming through each week. Bottom line, there are a lot of options out there. Innovative Results has chosen to use Versaclimbers because they offer the best solution for our clientele. They are incredibly efficient, effective and simple to use. Another incredible addition to the Innovative Results Gym! I was blessed to have access to a VC for a few months. What a workout. It’s like doing squats; not much fun but very effective. Me gusta la filosofía de este gimnasio. Puedes creer que haya un gimnasio con suficientes recursos para comprar caminadoras y decide no hacerlo para comprar otros equipos? CHeca las 5 razones por las que este gimnasio NO QUIERE USAR CAMINADORAS y decidió comprar Versaclimbers que cuestan lo mismo. I love this thing! I love how as an athlete I can get extra conditioning in without the impact of extra sprinting. Very useful for rehabing/avoiding an ab tear. We had a Versa-Climber in our gym on a Navy base that got alot of use. It was also the ideal machine to fit in small spaces aboard ships and was easy to disassemble and transport to various land deployment locations. WAY MORE sensible than hauling hundreds of pounds of barbells, bars, benches etc on aircraft and in vehicles already overloaded with our equipment. I couldn’t afford to buy one for my home gym. The best model/s were (and still are)expensive. I happened to be at a DRMO (kind of a “recycling” defense equipment storage yard where the stuff is eventually auctioned off) when I saw pallets and pallets of various exercise equipment that had been discarded due to being broken, rusted etc. On some of those pallets were Versa-Climber parts. I assessed enough to make a complete one – almost. After the auction I went to the guy who bought most of those pallets and bought as much of the reuseable Versa-Climber parts as was there. I think I paid about $100. They were an ugly rusted mess and all the parts weren’t there. I spent many hours running Hoppes gun solvent and scrubber pads through the rail to clean as much rust as I could out of it and soaked the chain in the solvent for days. Then I took all the parts and had them sandblasted and powder coated. Then I took them to the Versa-Climber company and had them assemble and upgrade it. In the end, I had about $1,200 and alot of elbow grease into a complete machine that is awesome. AND it doesn’t take up much of a footprint in my small home gym. I’ve used all the aerobic machines out there and the Versa-Climber is the absolute best. I bought a used home model about a month ago. I concur with your points. I own a Rower and a Precor AMT. I like low/no impact cardio systems (I broke my right leg in a ladder fall in 2002). The “Home” model is not a smooth as the commercial model, doesn’t have a resistance adjustment, but it is also half the price and still a great work out. The Home model uses a cable and glide system vs. Commercial chain drive. I think if you use the machine correctly the resistance isn’t necessary. PT’s I’ve talked to said they dial up the resistance for REHAB patients to “slow them down” and do more muscle/toning vs. cardio. Most people will use this for BLAST/TABTA style interval training once they have built up enough stamina to do it; for that you want speed and movement as your body is the resistance. I’ve lost 25lbs. and really feel this is a NO BS total body workout. It’s not a “fun” machine for people who want to read a magazine and watch TV while they workout. If you’re doing it right you’re lucky to hang on to the handles and keep your lungs in your chest. I also suggest you use it to “augment” your current cardio routine. Example: I may row or eliptical for 15-30 minutes and then do 10 min’s of 1 min sprints and 1 min rests at the end of a workout. 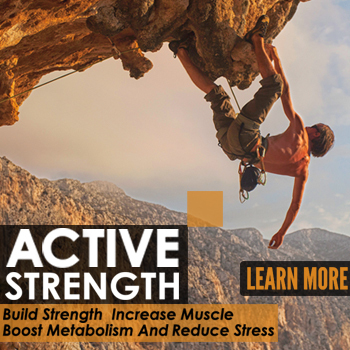 You can do 30 minutes on this if you use smaller motion stepping motions, etc….in fact they recommend you take 6-8 weeks before you really try and HAMMER out full stride workouts. It’s a serious machine that you really can’t “half step” your way through a workout on. I LOVE MINE. I’d like to upgrade to a commercial model at some point. im finally getting used to the versa climber i hated it before because it was so hard! but the more i do it, it becomes more tolerable. i recently injured myself running because i was not used to it, i can barley walk but the versa climber doesnt hurt! so its becoming my best friend! 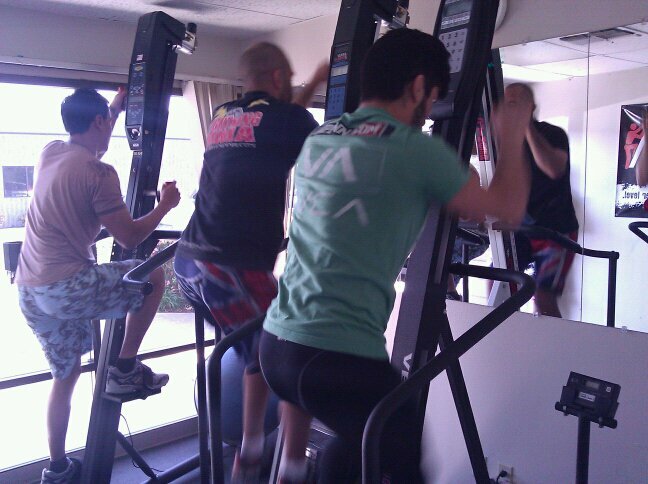 First time I saw this was either at Fitness Ranes in Hawaii or at IR! After I learned what it was, and as a trainer, I agree with this whole explanation! 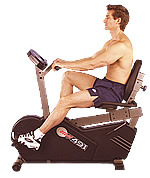 One thing I would like to add about ellipticals is that the main movement on an elliptical is coming from the lower back (lumbar spine) and a very important note is that our lumbar spine should be stationary; the least amount of movement from the lumbar spine will make it a happy camper! We one in my local gym in a runner that as recently been injured with a hip bursitis and wondering if I can go on the versaclimber with this injury ? Diane, that is a great question for your doctor or therapist. I do know that Versaclimber has a seat attachment available for rehab purposes. Might be worth looking at. Hope it helps! I just bought the non-diagonal original model, the guy told me it was the cross crawl, but I think he just didn’t really know the difference. In the end I think it worked out better. I have a damaged right knee, that is not going to get better, but I can nurse it along, having the arm support lined up with the knee is more important to me than some pixie dust about neuro programmed movements. I was most active in rock climbing ’72-’84, but my recollection is that when climbing it was preferable to move onto a RH/RL or LH/LL not proceed diagonally, unless the ground was very non-technical, though I could be misremembering that. Anyway, my issues are pretty specific, I would probably enjoy a cross crawl version also.